The town of Morrisville, North Carolina shares the Prestonwood Country Club (PCC) golf course with the town of Cary. While Cary voted in July 2015 to grant substantially more noise making privileges to PCC, on July 26, 2016 the Morrisville Town Council voted to roll back some of the special noise making privileges granted PCC in 2011. Prior to 2011, no landscaping could be done anywhere – including golf courses – at any decibel level in Morrisville before 7 am Monday through Saturday and before 9 am on Sunday. In 2011 a provision was added at the request of PCC to allow mowing of golf course greens – but no other surfaces – 7 days a week beginning at 6 am. Oddly, this additional noise making privileges granted PCC in 2011 came out of several apartment residents complaining to the Morrisville Public Safety Committee about PCC early morning landscaping noise. At the July 26, 2016 Meeting, many on the Council made it clear they simply believe that no business should get a special privilege. They felt many other businesses would also benefit from an earlier start and it’s not fair to favor one business. They wanted to return to the pre-2011 ordinance which granted no special privileges to golf courses. In a compromise between those that wanted to simply roll back to the pre-2011 ordinance and PCC who testified that returning to a 9 am start on Sunday would be catastrophic, the Council voted 4 to 3 to keep the special privilege for PCC, to allow them to landscape 7 days a week but now at 7 am instead of 6 am. Morrisville Mayor Stohlman provided the leadership to give Prestonwood what he understood from several face-to-face meetings with Club management was most important to the Club; being able to start all preparations – not just putting greens – at 7 am on Sunday instead of 9 am. Mayor Stohlman, Mayor Pro Tem Rao, and Councilmen Schlink and Garimella voted for the compromise noise ordinance amendment, and Councilman Cawley and Councilwomen Scroggins-Johnson and Johnson voted against. Further, several on the Council realized that since the first golfers don’t get to the portion of the PCC golf course in Morrisville until well after 8 am anyway, shifting the Morrisville start time to 7 am still gives the Club the same one hour plus preparation time they have in Cary by starting at 6 am. Also, the compromise lets 483 hardworking Morrisville families get an extra hour’s sleep. Since the vote was 4 to 3 which is not a “super majority” the Town Council must vote again on the same changes at their August 9, 2016 regularly scheduled meeting. PCC has undertaken a very aggressive campaign to get at least one Council member to change their vote in the 2nd confirming vote on August 9th and it will be very interesting to see if someone changes their vote and why. In July 2015, the Town of Cary, North Carolina has approved changes to its Noise Ordinance that will adversely impact all its residents and neighborhoods, but especially those adjacent to the 5 golf courses in the Town. Cary golf courses now have unprecedented noise making privileges. Also, the peak nighttime noise level for everywhere in Town has been raised 23% to 63 dB(A). There remains no means of enforcement if the sound maker is in Cary and the affected homeowner is in Morrisville, which happens often. 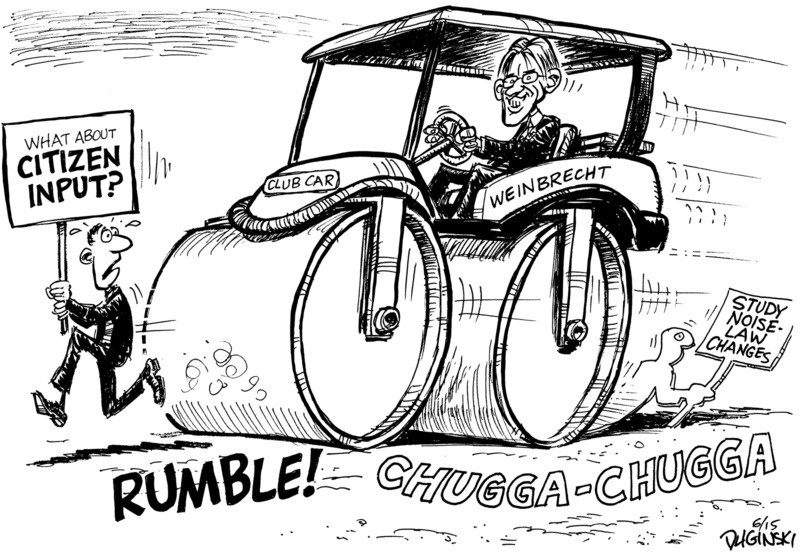 The following Video clearly demonstrates just how loud lawn maintenance activities at the Prestonwood Country Club have become, now all of it made legal under the direct leadership of Cary Mayor Weinbrecht. Watch Town Council Discussion and Vote↑ Listen carefully to Councilman Ed Yerha’s opening remarks as he perfectly sums up the issues and is clearly stating how Cary is very much not handling the noise ordinance in “the Cary way.” This is exactly what we were trying to accomplish with LetUsSleep.Org. Immediate Impacts – For all practical purposes, and for the most offending equipment (backpack blowers, weed wackers, etc. ), this raises the nighttime allowable noise limit, everywhere in Cary from 60 dB(A) to 63 dB(A). This may not seem like much, but the decibel is not a linear scale. 63 dB(A) is 23% higher in perceived loudness than 60 dB(A). 70 decibels is twice as loud as 60 decibels. 60 decibels is a conversation. 65 decibels is a residential class backpack blower. 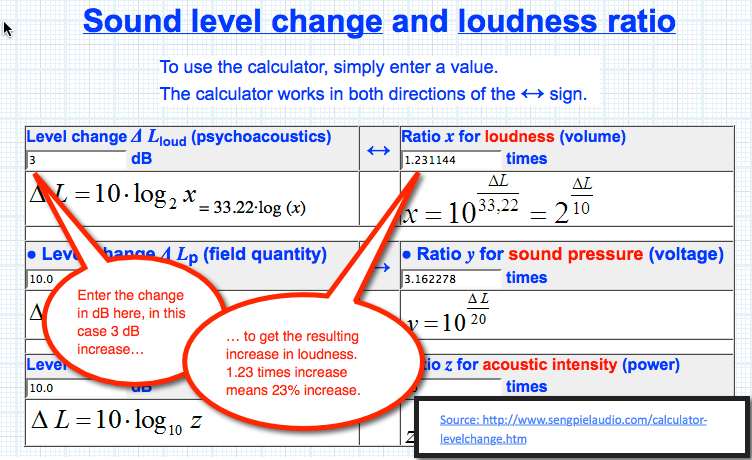 Relationship of Decibels to Loudness – a 3 dB increase is a 23% increase in loudness. This is in itself a significant increase. But it gets worse. Cary measures lawn maintenance noise at the property line of the complainant, not at the noise source (like they do with a noisy muffler on a vehicle). The combination of averaging, the 23% higher limit, and measuring from farther away will very likely mean that backpack blowers, weed wackers and other highly noisy equipment will be legal to operate in Cary anytime day or night, any day of the week, anywhere in Cary. Immediate Impacts – Saturday and Sunday lawn maintenance in the off-season will begin at 7 am instead of 9 am. In season, starting at 6 am mowing the greens is expanded to mowing, blowing and raking of all of the course’s playing surfaces. The specific addition of “blowing” dramatically increases the noise levels. The commercial backpack blowers used by golf courses are rated at 75 dB(A) (more the twice as loud as residential backpack blowers). The specific addition of “all playing surfaces” dramatically increases the amount of area being mowed and blowed, hence dramatically increases the amount of time mowers and blowers are operating. The proposed changes in the Cary Noise Ordinance got final approval July 9, 2015 and is unprecedented in the state and allows Cary golf courses to conduct all manner of lawn maintenance and landscaping — including use of commercial backpack blowers — on all playing surfaces with no decibel limit as early as 6 a.m. 7-days a week, April through September. © 2015 Thinker Media, Inc. All rights reserved. When you read the preceding statement, your first reaction might be this doesn’t sound right. This would sure be out of character for Cary leadership and surely can’t be their intention. We suspect it is not anyone’s intention, but as you read on, you will see the statement accurately describes the consequences if the steamroller to change the Cary Noise Ordinance continues on its current path. And it’s not just the more than 80+ on-the-record supporters of the concerns raised on this website that are calling for a delay in making these changes. Morrisville Mayor Mark Stohlman↑, representing 25,000+ residents, and Preston Community Association (PCA) President Alan Knuckles↑, representing 1,300+ Preston homeowners surrounding the golf courses, had both sent e-mails of concern and requesting a delay to Cary leadership prior to the May 5, 2015 Town Council meeting. Mayor Weinbrecht and golf course managers both refer all these people as a “few individuals” in a Cary News↑ article. All these initial requests, and followup requests, have all been ignored. It’s not just people who live on the golf course that will be adversely impacted. Every resident of Cary will be facing higher noise limits if the proposed changes in the Noise Ordinance and the methods of enforcement become law and procedure as expected on July 9, 2015. Also, here’s the latest from the News & Observer – Cary News. The PCA Board representing 1,300+ homes surrounding Cary golf courses voted May 21, 2015 to send letter to the Town of Cary formally opposing Staff Recommended changes in Noise Ordinance and requesting more time for citizen input (Click here to read the letter.↑). Cary Town Leaders in the Cary News claim that they are not rushing these changes through, but as of May 7, 2015 the Cary Police are already enforcing the noise ordinance as if it has already been changed to the Staff-recommended Council-approved version. That’s right, even before the final version has been voted on, it is essentially already in effect. There has been no public hearing and there was only 17 minutes of public discussion prior to the May 5, 2015 Council meeting where the vote to approved Staff recommendations was taken (most of this time was spent on Mayor Weinbrecht describing what the golf courses wanted). There was only 3 business days between the Staff’s 180-degree turn on April 29, 2015 from not supporting the golf course requested changes to completely supporting them, and their approval on May 5, 2015. The current Cary Noise Ordinance works by exception. The idea is, no one can make any disturbing noises except as provided in the Noise Ordinance. The following are the key provisions. “Sec. 22-107. Sounds impacting residential life. There are two important aspects to the issues at hand resulting from how the Ordinance is structured. The 24/7 allowable sound limit described as “cause a sound that exceeds 60 dB(A)” is an absolute limit that cannot be exceeded, except by one of the Exceptions specified in the Ordinance. It is the view of LetUsSleep.Org that it is clear in the Ordinance that if the limit is exceeded for any period of time (i.e., instantaneous), it is a violation, just like a blood alcohol limit when driving and other not to exceed based statutes. Using the Exceptions approach creates some interesting loopholes. For example, under this Ordinance you can use a lawnmower any day of the week, any time of the day or night, as long as you don’t exceed 60 dB(A) at any time. Further, since the Exceptions don’t also include a decibel limit, you can use a lawnmower (or any other equipment as long as it is “operated with all the manufacturer’s standard mufflers and noise-reducing equipment in use and in proper operating condition.”) without any decibel limit during the times and days allowable in the Exception (this interpretation of the Ordinance language was confirmed by Deputy Chief Tony Godwin in his report to the Town Council on May 5, 2015↑). Click here↑ for the complete Cary Noise Ordinance – Select Chapter 22, Article IV, Division 2 Noise. The following changes were initiated by the 3 Cary golf courses in an October 1, 2014 Letter from Golf Courses to Mayor Weinbrecht requesting changes in Noise Ordinance.↑ They even supplied proposed wording for the new ordinance. Note: Raising the decibel limit from 60 dB(A) to 63 dB(A) is a significant 23% increase. Decibels is not a linear scale. 60 dB(A) is a normal conversation and 65 dB(A) is a backpack blower.↑ 70 dB(A) is nearly twice as loud as 60 dB(A). This decibel increase will affect everyone in Cary, not just people who live near golf courses. These are material changes that have the clear potential to significantly increase the type, level and extent of undesirable commercial noise impacting homeowners. Click here↑ to read the complete report on the final Staff Recommendations to modify the Noise Ordinance. Basically, after 5 months of study, the Staff rejected the golf courses’ request for changes and recommended to keep the ordinance the same except for how decibels are measured and truly clarifying the key definitions. Staff originally recommended that “golf course greens” be clarified to be “only the putting green” and ”mowing” is “strictly for grass cutting.” But after the meeting “to discuss issues” and only a few days before the May 5, 2015 vote to approve Staff recommendations, the Staff recommendations changed 180 degrees and gave golf courses what they wanted. The vast majority of cities in North Carolina have noise ordinances that do not allow any lawn mowing and landscaping by golf courses — or any other commercial entity — before 7 a.m. Cary is a rare exception that currently grants golf courses permission for “mowing of golf course greens” beginning as early as 6 a.m. 7-days a week, April through September. There are over 60 golf courses in the 9 county Triangle Metro area. According to Cary Deputy Chief Tony Godwin’s March 12, 2015 report at the Cary Town Council↑ meeting and the Noise Ordinance Staff Report↑, only the towns of Wake Forest, Cary and Morrisville allow golf courses to begin “mowing of golf course greens” as early as 6 a.m. There are 8 golf courses in Wake Forest, Cary and Morrisville. This means that 87% of the golf courses in the Triangle Metro area, many of them higher ranked↑ in quality than any of the Cary golf courses, provide an excellent golf experience in towns where noise ordinances allow golf course maintenance activities no earlier than 7 a.m. Even the golf mecca of Pinehurst does not give golf courses a special exemption that allows an early start before 7 a.m. according to Godwin. A number of citizens have been complaining that the golf courses have been interpreting “mowing the greens” to mean mowing includes using leaf blowers and greens means any playable surface (tees, fairways, greens, etc.). The Cary Town Council voted on May 5, 2015↑ to affirm the Staff recommendations and directed them to prepare final language to re-present to the Council for a final vote to modify the ordinance. No further public hearings are planned. Essentially, Town Staff has recommended and the Town Council agreed that Cary will address citizens concerns not by stopping the violations, but by making the violations permissible. This is certainly a new approach for handling citizen complaints and ordinance violations in Cary. Cary and Morrisville town boundaries are completely interspersed in the Preston neighborhood with some of the residential property in Morrisville while the immediately adjacent golf course property is in Cary. Residents have reported in the Public Speaks Out segment at Town Council meetings, that when they called to report what was believed to be a noise violation, Cary Police said they cannot respond because the complainant residence was in Morrisville. When the resident then called Morrisville Police, they sent out an officer, but the officer said they could do nothing because the source of the noise, the golf course, was in Cary — Catch 22. Note: While Cary Leadership has expressed genuine concern about this Catch 22, this concern has not been addressed in the current Council-approved Staff Recommendations. At the May 5, 2015 Town Council meeting, Mayor Weinbrecht informally (i.e., there was no motion) directed Staff to look into options to address this concern. There is no Inter-Agency agreement between Cary and Morrisville that would enable an officer to cite a Noise Ordinance violator across jurisdictions. To the best of our knowledge, a Cary golf course has never been cited for a Noise Ordinance violation for lawn maintenance noise (Cary PD researched this for over a month and did not report to us finding any record of citations issued). Since citizens have reported numerous what they believe were violations without a citation being issued, there appears to be an enforcement issue. Perhaps responding to citizen frustration, Cary Police, represented by Deputy Chief Tony Godwin, has recently begun an effort to get clarifications and directives from Town leadership to improve the enforceability of the Noise Ordinance. A great number of residents in the Preston HOA are golfers and members of the Prestonwood golf club. The vast majority (87%) of golf courses in the Triangle provide a great golf experience beginning high noise work at 7 a.m. year-round like other lawn maintenance and landscaping businesses. These concerns are not anti-golf. We simply believe the Cary golf courses are capable of operating their businesses under the same noise ordinances as the vast majority of golf courses in the area. Every procedure that Cary golf courses claim requires the earlier start of noisy equipment has a quieter alternative that doesn’t need the extra hour. For example, modern golf courses were able to maintain pristine playing surfaces for more than 50 years before the backpack blower came into use. These alternatives may be less operationally convenient for crews and management, require updating equipment, and raise costs slightly, but the golfing experience does not need to suffer. We are not trying to require golf courses to make less noise. We are trying to stop changes that will allow them to make more noise. Golfing as a recreational activity is generally in decline↑ and our economy continues its slow recovery from a prolonged severe recession. Therefore, we understand, sympathize and respect golf courses’ current fervor for controlling costs. While golf course economics should be part of the discussion, this should not be used to obscure the facts of this issue. This is not about golfers vs. homeowners. This is about private business being granted special convenience and cost reducing privileges at the expense of residents peaceful enjoyment of their homes. Cary consistently ranks as one of the best places to live in America because Leadership and Staff have an outstanding record of working together to make quality decisions quickly and efficiently. As a result they don’t have a lot of experience with citizen push back when they get a bit ahead of themselves because it doesn’t happen very often. Thus far, Cary Leadership’s response to citizen, Mayor Stohlman and PCA President Knuckles’ concerns could be described as perfunctory. Perhaps this time, the decision was just a little too quick and a little too efficient. These suggestions address a combination of issues that have existed for a long time in the Noise Ordinance that are made worse by the current proposed changes. Slow Down. Cary should take more time to coordinate with Morrisville to get an ordinance that everyone can understand, is easy to comply with and easy to enforce. This will allow time to include citizen stakeholders in the information gathering process. Close Loopholes. Use of lawnmowers and landscaping equipment should simply not be allowed 9 p.m. to 7 a.m. regardless of noise level, except by permit or in a community emergency. dB(A) limits should cover all hours 24/7/365, louder in the day (e.g., 7 a.m. to 9 p.m.), quieter at night (e.g., 9 p.m. to 7 a.m.). Lawnmowers and landscaping should not be allowed at night just because the use of that equipment does not exceed the dB(A) limit, and there should not be an absence of any dB(A) limit just because it is day. Go To The Source. Measure noise at the source. The current practice of measuring noise at the edge of the complainant’s property creates jurisdictional contention. Anyone from any jurisdiction can report a violation. Therefore, regardless of where the complainant lives, they can report to the jurisdiction where the noise is being generated. This should be handled just like excessive muffler noise on a street vehicle. This will make the Ordinance simpler and easier to comply with and enforce. This will also help golf courses because, unlike the varying distances to an adjacent property line, they can test precisely how noisy their equipment is and not allow that equipment onto the golf course until the Ordinance permits. The statuary decibel level can be raised to accommodate the new measuring point and allow them to use the equipment they need, in consideration of the various times of days in the Ordinance. Research Appropriate Decibel Limits. Use the same noise meters used by the Cary Police department and test against the golf course maintenance procedures they actually need to do with the equipment they normally use. The test should consider lawn care effectiveness and noise minimization alternatives. Everyone should want the real numbers. The dB(A) limit must include an instantaneous limit, but depending on the research results may also include an average limit, because they are both factors in annoyance. Exceeding either the instantaneous or average limit should be a violation. Classify Equipment. Newer equipment specifically designed for golf courses is generally quieter than general commercial, agricultural, or industrial equipment. There should be a not to exceed dB(A) limit for standard golf course lawn maintenance equipment (“Standard Equipment“). There should be a separate higher dB(A) limit for loud heavy equipment that should specifically include chainsaws, wood chippers, farm tractors, backhoes, front-end loaders, etc. (“Heavy Equipment“). Standard Equipment can be used from 7 a.m. to 9 p.m. 7-days year round, but Heavy Equipment should only be used from 9 a.m. to 7 p.m. 7-days year round (this would benefit golf courses by moving up the 9 a.m. start on Saturday and Sunday). This will make the Ordinance simpler and easier to comply with and enforce. It should apply town-wide, not just for golf courses, when Standard and Heavy Equipment is used anywhere under the Lawn Mowers and Landscaping Equipment Exception of the Noise Ordinance. If Suggestion 3 Go To The Source, is adopted, then the dB(A) level can be used to help define the equipment specification in the Ordinance. Heavy Equipment can be defined as chainsaws, wood chippers, and any equipment that exceeds a specified dB(A). Eliminate the Golf Course Exception. If we measure noise at the source (Suggestion 3), get the dB(A) limits right (Suggestion 4), and classify equipment (Suggestion 5), then the special exemption for golf courses will not be needed for a quality golf experience. It may be inconvenient and cost more for the golf courses, but it is not needed. This exemption is really little more than an economic benefit for a private business. We still envision that golf courses could position crews and begin work before 7 a.m., just not start using the noisier equipment. 6 a.m. is just too early for commercial mowers and backpack blowers to be active on all playing surfaces. Check out our Blog↑ page for the latest information. Check out our Resources↑ page to see the documents, e-mails, correspondence, and videos that evidence the issues and concerns addressed on LetUsSleep.Org. Please consider signing our Petition↑ to the Cary Town Council to delay the Noise Ordinances changes until their impact can be further studied. Thank you for your visit, interest and consideration. Golf courses are beautiful and often attract people to purchase homes adjacent who assume no maintenance is required especially in the early hours of all day. Generally play begins between 6 and 7 am and the course must be prepared for play each day. It is a shame you did not understand this prior to purchasing your home and expect the course to change it’s procedures to accommodate your expectations. Perhaps the realtors should be required to explain to potential buyers – this issue as well as the potential for players to sometimes trespass in order to play the game of golf. Perhaps you should consider living elsewhere, but I have heard of some folks who moved to the country and then complained the crickets were too loud. Good luck with your issue, but the realtors should be required to disclose this issue to potential buyers. We did check the noise ordinance before we bought and, as it has said since 1994, it states that unless you live on a green, you will not be subjected to any noise exceeding 60 decibels until 7 am. Therefore, we bought on a tee, not a green, and have never complained about routine maintenance. We are, and always have been for the past 10 years, happy with that arrangement. We are not trying to take anything from golf. We accept and honor our deal to buy on the golf course. We’re trying to raise awareness that THEY are changing the deal. The issue is that they are making dramatic changes without a public hearing or even any real citizen input. The changes will clearly allow noise without any decibel limit on golf courses beginning at 6 am 7-days a week, and possibly allow equipment like backpack blowers 24/7 everywhere in Cary. A pre-purchase notice from realtors like you suggest would not have helped in this situation because the situation changes after we purchased, but we very much appreciate your ideas. We’d like to get more ideas and come up with a plan everyone can live with, including considering keeping everything exactly as it has been for the last 20 years. Sadly, only golf course ideas have been considered thus far. Mayor Weinbrecht makes it clear he will push this through and once the changes start affecting everyone, this issue will become active again. Of course it will be much harder to undo the law than it would be to delay it and get more citizen input. With all that’s broken in government today and the great number of problems already here, it’s hard to get attention to a problem that is anticipated, but not yet arrived. Nevertheless, we thought we’d try our best. Thanks for your valid comments and thoughtful ideas. I saw your piece on WRAL tonight and just wanted to pass along my observation from having worked on and managed several area courses. Realtors do try to downplay the noise issue for many potential home owners. When Prestonwood was a young course and air traffic at RDU was increasing, some realtors actually made it a point to show potential home owners properties in your area knowing runway practices and the scheduling of flight paths. I’m sure the similar tactics have been used as far as golf maintenance noise. I know many courses over the past 15 years or so have found themselves having to do more things to remain profitable and these include providing more and often earlier tee times, as well as better course conditioning. I actually had a General Manager from up North tell me we needed to prepare the course for play to begin at 5:00 am (which is a start time for some courses there due to the shortened season). I needless to say, had to fight that idea, but for some of the folks who have moved here that is considerd acceptable. We compromised with 6:00 am as first tee time. The next GM changed the first tee time to 5:45, but most of the earliest players actually lived on the course and preferred it. To prepare the course – debris must be cleared (using blowers to be efficient), and then putting greens mowed. A few top end courses do consider greens to include fairways and tees and for most all courses these areas are mowed before play begins in all major events. This is done not just to cut the grass, but to remove debis from evening and night-time storms and winds. Removal of the morning dew also reduces disease and therefore reduces chemicals used to maintain the grass (typically in the industry referred to as turf). This just cannot be done in the evening during play. As far as noise levels, most towns and cities in our area have throughout the years reduced allowable levels and adjusted times to be respectful to the needs and the wishes for all in the community. Measurements have always been made from the edge of the property where the source is located and not the source. This is to allow the property owner to use their property as they see fit while also repecting the neighbors. In the video segment, while there did seem to be several mowers around the tee area contributing to a greater noise level, it did not appear to be extemely early and once finished would have moved to the next area away from you. They could have sent the mowers 1 by 1 to irritate you over an extended time. Have you tried to sit down with your club and course managers to fully understand what they must do in order to remain in operation. Try the approach of understanding their needs, they without a doubt have heard all your wants. Then work towards a compromise. Prestonwood has enough courses, perhaps they could make some adjustments by rotating courses and starting times to accommodate not just you, but others in your sudivision even if it is not everyday or every weekend. Have you considered discussing how much they have spent purchasing newer and quieter equipment, you might be surprised. I know the John Deere Turf Division used to be proud to introduce most of the new technologies at Prestonwood, especially since they are headquartered right here in the Triangle. Lastly, I have remember when Prestonwood wasn’t a 54 hole club and could hardly afford to maintain all the holes on a regular basis and hardly had the equipment to maintain 18 holes. The fact that the club has grown and prospered has only helped your property values and your quality of life. I know the economy has taken its toll on courses throughout the state (including some just as prestigious as where you live). I would hope that Prestonwood’s business plan is solid and the obstacles are managable, but would you really want to make it so difficult the view off you deck becomes grass 3 feet tall. Worse yet, what if they had to sell the 9 holes behind you to a developer or just return it to its natural state? If you like your current view, you should understand all the repercussions of the obstacles you throw in the way of your club, or worse yet – the clubs which operate on tighter margins and to which you would also impose your restrictions. What if by changing the noise ordinances – 2 courses fail? How many jobs would be lost, how many homeowners would lose value in their property. This would cause me and many people I know to lose sleep. I hope you can understand that I consider you to be somewhat selfish by wanting to change an ordinance that affects all instead of seeking a resolution with the party which you have stated has changed their procedures and therefore negatively impacted your life. Thanks James for this message. As I stated earlier to Bob, now that the ordinance is passed, it is clear that a) noise levels have NOT increased, and b) maintenance is being done at the same hours as previous. I live on Highlands and can attest to this. They were ratifying practices in place for many years with this ordinance, not changing the rules so that more noise and earlier hours could be obtained. Things are getting better at Preston (as strongly urged by all the members), not worse. A lot of ground repair is underway which is expensive to do to counter the condition from the harsh winter we experienced. You made many great points. I particularly like your point about understanding the needs of the course owner and management team. They are trying to deliver a good product. Regarding the video taken by Bob, this was abnormal for Prestonwood, they apologized, and have demonstrated that they will listen to homeowners and do what they can to keep the peace. It is all about communication!. This may be the strangest debate ever because we completely agree on the current circumstances and the salient facts of the matter. Regarding your statement “it is clear that a) noise levels have NOT increased, and b) maintenance is being done at the same hours as previous.” We agree and that has been our experience thus far as well. It may be just a honeymoon, but it’s been good! Things on the 5th tee of the Highlands may even be a bit quieter than it’s been for the past 10 years that we’ve been happily living here. You’re also right about things getting better at Prestonwood. We’re excited about the new $3.7 million expansion of the Fitness center, which I’m using for my recovery in my quest to get back to golf and tennis. The “Attack of the Mowers” incidents in early June is a non-issue as far as we are concerned and is completely behind us. Prestonwood has clearly demonstrated they can improve the the golfing experience and not raise the noise burden on homeowners. Where we may differ is our view of the future and how we may be able to address unexpected changes. You apparently are comfortable things will never change under current Prestonwood ownership and management and by extension ownership and management will not change. We are not comfortable these will not change and with our options if it does. These special group membership deals that Prestonwood just announced, peace with homeowners, certainty in noise enforcement, and these long overdue “fix-up” projects could be either proof of existing owner/management commitment to good stewardship or it can be getting everything ready for a sale to the massive private equity forces eyeing golf. Only time will tell. But I was a lot more comfortable when we had a noise ordinance AND Club goodwill to protect us. Now Cary residents only have goodwill and the hope that ownership and management doesn’t change. I truly hope you’re right and that I’m needlessly concerned. Then again I am an expert on economic and industry trends . Nevertheless, we’re going to approach our concerns in a positive way by establishing baseline reference information and data so if this issue comes up again, it can be addressed more factually and less emotionally. For example, no matter what the Cary noise ordinance says, it’s basically meaningless to report a noise problem in Cary and the noise ordinance is unenforceable across borders. Also as a matter of policy Cary PD has not sent out officers, issued incident reports/tickets/warnings, or tracked the data on lawn maintenance noise complaints. So there was no data to say whether or not there was a real problem, making it easy to dismiss expressed concerns as nothing more than the musings of a few individuals. We’re working with Deputy Chief Godwin to develop and publish a meaningful noise complaint reporting and tracking system for all of Cary so next time — if there is a next time — we’ll have some hard data on the severity of the problem. So even if our concerns are realized in the future, hopefully it will be a less painful process to make the necessary adjustments. Remember, the new noise ordinance was passed with the requirement of a 1-year staff review. It’s been a pleasure flushing out the issues with someone thoughtful and respectful like yourself (you can’t believe some of the email/comments we got). Thanks for your engagement and in the end we truly believe things are better as a result of our mutual engagement. Seriously, When you buy or build a home in the golf course community and especially on the course you should full well expect early mowing! This is common practice throughout the country. I have no problem with the ordinance change. Fair enough. Perhaps there is just not a lot of empathy for people who own houses on golf courses. But it’s not only about those who chose to live on the golf course. What do you think about raising the decibel limit town wide from the current max of 60 db to a 1 minute 60 db average with a 63 db max, keeping in mind that 60 db is a conversation and 65 db is a backpack blower. Decibels are not linear, so 70 db is twice as loud as 60 db. This proposed change, along with the Cary PD enforcement policy to not measure noise at the source but to measure noise at the complainant’s property line, will likely mean you can use backpack blowers 24/7 anywhere in town. I guess anyone who doesn’t like that can just move from Cary, right? Anyway, your comment represents a common first reaction and it’s a valuable part of the discussion. Thanks for taking the time to comment. I think it is great that you’ve stepped forward and done something about this issue. We face the same issue in Lochmere but even worse. The golf course hosts charity events that involve using a mechanized golf ball launcher that is the noise equivalent of a shot gun going off over and over. I’ve contacted the City of Cary and Police department about this and they do absolutely nothing about it because supposedly golf courses can be as loud as they want after 7AM. Really? I can’t even conduct teleconference when this is going on. People on the phone ask me if I’m calling from a rifle range. Let’s hope Preston golf doesn’t get the same idea. Any advice or useful contacts would be appreciated. Mechanized golf ball launcher? Really? The sound you are hearing is the club head striking the ball. Bet you live next to a tee – the place where play begins on each hole. I would like to provide a different perspective on the noise ordinance. I live on Highlands #1 in Preston and moved here specifically to take advantage of 1) the golf course view, 2) the ready access to the golf course, and 3) to live within a golf course community. I paid a premium to live in the Prestonwood community, with the added expense specifically for my view (which was my choice), due to the golf course amenities noted above. I understood the trade-offs when I did, namely that 1) my property would be subject to misguided golf balls coming onto my property, 2) though I would experience many unique sounds of nature I would also hear cranky maintenance equipment throughout the day, and 3) there would occasionally be errant golfers in my backyard (sometimes confused and bewildered) looking for their lost possessions. For me the value of living on a golf course far exceeds the drawbacks noted above. My wife and I love it though I fully appreciate that it is not for everyone. The current and future value of my house reflects the value of a golf course view all things considered. Regarding the proposed ordinance, I have no issue with golf course maintenance starting at 6AM. A simple solution would be to set a decibel limit for 6 to 7 (or 8) AM, and one that would apply thereafter. As a business concern, a golf course would not start maintenance at 6AM unless it was absolutely necessary. It is more costly and difficult to schedule work at that time (I tried for years with my kids). Golfers will not tolerate reduced tee times or on-going maintenance during the day when they are paying the bills. For those who are concerned about the noise affecting their sleep, I would suggest either finding a non-golf course community or looking for a sleep solution that removes the problem. My wife and I simply use a sleep machine to drown out the noise early in the morning (we live on a golf course but sleep by the ocean) and have never been woken as a result. There are many other solutions that would allow someone to not hear a noise that they do not want to hear.. If a golf course needs to schedule maintenance at 6AM, noise limits can provide some relief, but ultimately the homeowner has to accept the good with the bad. Dave B., why is it more costly to work at 6 am than 7am? No it is not that is is more costly to work at 6 than 7, it’s about the amount of time you have to get certain things done and keep ahead of golfers. If your tee times start at 7:30 and you start that work at 7:00 you are only 30 minutes ahead of golfers. If you can start at 6, you are 1 1/2 hours ahead. So if you have an hour more time to do the same work, you need fewer workers and machines. The specific activities that are done ahead of golfers are a small part of all the work overall, but more time does translate into more savings. I not advocating anything the hinders that work getting done, golfers deserve a great course. But there is no denying they are getting their cost saving at the expense of certain homeowners. Thanks for the opportunity to clarify. It is more difficult to schedule workers early in the morning so that can add to some scheduling cost. But overall, it is a savings to Prestonwood to start at 6 versus 7 because they can work unobstructed compared to having to work during golf hours. By moving maintenance start times to 7AM it would mean a) having to use a lot more people and machines to get the course prep work done in a compressed timeframe and b) it would likely lead to additional maintenance having to be done during normal golf hours which is more costly (i.e. more time required to get the same work done) and more agitating to members who do not want to play around maintenance crews. I am confused by Bob’s comment that the more time it takes for workers to mow the course the less cost, I think it is just the opposite as they are paid per hour. The cost difference comes mainly in the cost of equipment, not wages. Consider that it takes 2 operators on 2 machines 1 hour to mow a section, but 1 operator on 1 machine can do it in 2 hours. Same total wages, but 1 less machine. Of course, it more complicated than that with machine operating costs vs. capital cost, but generally more time to do a job will save you money. You also raise a good point about separating golfers from maintenance, and here it is a matter of degrees. For example, should maintenance then be justified to begin at 5 am, or even run 24 hours a day? Should golf be able to use bigger, more efficient, but nosier industrial equipment. If the absolute only consideration was golf, the answers are clear. I personally know well how golf can make you crazy in pursuit of the perfect game and some of messages I received basically say nothing matters but golf and you chose to live on a golf course and therefore you should be given absolutely no consideration. Not withstanding the extreme positions, remember we have been advocating only for maintaining the status quo until all stakeholders could come to the table and see if there was a better solution than putting everything in the hands of ownership/management — that I believe there is a real possibility will change in the next 3 to 5 years. If after working together it was determined there wasn’t a better solution — and while I can’t speak for my many neighbors who are similarly uncomfortable with these change — I for one would side with golf. That’s right, if it was shown that the Club’s survival and ability to continue to provide an excellent golf experience were in jeopardy by not making more noise earlier, or even that investments and operational improvements were being made to move the Highlands up from 27th in the State to say top 5, I would support the changes that are required to make that happen. Remember, while virtually all golf courses in the State start work around 6 am, they all function effectively holding off on the noisier activities near homes until 7 am to comply with local noise ordinances and to maintain good community relations — which we hope will continue in Cary. But, even if you believe this is all simply about codifying current practices, why do Cary golf courses have this apparently unique need to codify it laws when nothing similar is occurring elsewhere in the State. Nevertheless, right now it looks like they are moving ahead using brute political force and many are going along hoping for the best. The inescapable result is that, to the extent anything does change, they are shifting some of the burdens of our golf passion to others. In the end I guess I’m just not a fan of using brute political force, not because I’m a whip about using power, but because I know just how much lingering resentment it can cause and the unfortunate ways that can manifest itself, and just how much the quality of life depends on neighbors getting along and respecting each others lifestyle and values. Dave B., the above comment is clear, your previous comment threw me off. “As a business concern, a golf course would not start maintenance at 6AM unless it was absolutely necessary. It is more costly and difficult to schedule work at that time” I agree it is less costly to start maintenance further in advance of golf play. Wow, I can’t believe how immature some of these comments are. Let’s all grow up people, please, and be a little more respectful of others. I personally think the change in the noise ordinance is simply unacceptable. I belong to the club and respect the fact that they have much to do in order to maintain the golf course – but they have been doing a fine job in the past with the current noise ordinance and time restrictions – so not sure why a change is needed now. if they need more time to do an even better job, one solution would simply be to hire more people and get the course maintenance completed within the current time periods allowed. If this mean my PWCC bill goes up a little, so be it. Certainly this ordinance and many others should be written clear and concise. A high school reading level should be adequate for someone to know if they are breaking a law. I have sympathy for anyone having a negative impact on their life due to a change made by others. Maybe if you spent a day with a golf course superintendent you would have a better idea of what needs to take place for paying customers to enjoy their golf experience. From a safety perspective, all maitenance staff needs to be out on the course well ahead of any golfers. A 6am start is not uncommon and used to be the norm. No doubt golf course superintendents have a tough job. And I have talked to them, been golfing hundreds of times among lawn maintenance activities, and spent over a decade observing what they do from my back yard. There are alternatives, such as blowing at the end of the day and mowing in the morning. The debris they most worry about, e.g., trash and tees are not likely to appear overnight. The quality of the playing surface would be the same, the noise impacts would not. It’s clear they are advocating in their interest, not just trying to continue current operations, and we can respect that. But it rarely leads to a good outcome when only one side’s advocacy is heard. Starting at 6 a.m. is not the issue, it’s what “starting” means that is, and whether starting must include the most noisy activities and whether those activities can be postponed until 7 a.m. Remember, we are not asking to take anything away from the current ordinance that allows mowing the putting greens at 6 a.m. We are trying to get a public hearing about granting them a virtual free reign to do anything at 6 a.m. including blowers, chippers, and chainsaws. Read the actual staff recommendations report, you’ll see they are dramatically increasing their noise making privileges. Finally, you have a valid point and the golf courses have had hours of private meetings with staff and leaders to make the same points you are making. We’re primarily asking for equal time and we’re confident working together in good faith can develop an ordinance we can all live with. Thank you for your interest and comments. If you don’t like early morning noise, you shouldn’t live on or near a golf course. Complaining about early morning noise when you live on a golf course, is like complaining about there being meat on a hamburger…. This issue is not golf course noise in general, it is about a change to increase the noise and allow it to be louder without any input from people impacted. I’m sure you’ll agree there is some level of noise and some time of start that is unreasonable to start making that noise, and the purpose of a public hearing is to find a level we can all live with. We are not trying to eliminate golf course noise and we accept the deal we made when we made our purchase. It’s that they are now changing the deal that is the issue. Also 87% of the golf courses in the Triangle, plus the great golf courses of Pinehurst, do a great job while starting the noisier activities at 7 a.m. Thank you for your interest and comments. •	Sec. 12-5004. – EXCEPTION TO LIMITATION STANDARDS. Equipment being used for construction, provided that all equipment is operated with all standard equipment manufacturer’s mufflers and noise-reducing equipment in use and in proper operating condition. Emission of sound from any source or sources on public rights-of-way. Excavation and loading of spoil and excavation materials from sites located within the boundaries of the secondary fire district as described in §5-2034. Excavation and loading of spoil and excavation materials from sites located on City owned sanitary landfill sites. Properly installed and operating residential heating, ventilating, and air conditioning systems. Why would you buy property on a golf course and not expect to have noise early in the morning. Players expect the course to be ready for play by a certain time including many homeowners who are members. Maybe the course should build a 10′ wall around the property line to block the noise from your property. Then I’m sure you would whine about your view to the golf course. Maybe you should think about insulating the walls in your home a little more to block the noise if it bothers you. I can’t believe the gall of some people, buy on a golf course and then whine because it has to be maintained. This issue is not golf course noise in general, it is about a change to increase the noise and allow it to be louder without any input from people impacted. I’m sure you’ll agree there is some level of noise and some time of start that is unreasonable to start making that noise, and the purpose of a public hearing is to find a level we can all live with. We are not trying to eliminate golf course noise and accept the deal we made when we made our purchase. It’s that they are now changing the deal that is the issue. Also 87% of the golf courses in the Triangle, plus the great golf courses of Pinehurst, do a great job starting at 7 a.m. Thank you for your interest and comments. Prestonwood is one of the few courses in the area that has continued to invest both the time and money into its courses to make not only the golf enjoyable but the neighborhood homes values increase/appealing. Face it the noise associated with course maintenance is part of choosing to live on a golf course. Next time you want to complain think about the homeowners that live at both Wake Forest CC and Crooked Creek GC, both clubs have closed the doors and now property values are in the tanks and once high end custom homes can’t be given away! We certainly wouldn’t want to do anything that put any club’s financial future at risk. If there is a pubic hearing the golf courses could put forth their evidence that starting chainsawing at 6 a.m. instead of 7 a.m. was critical to their financial survival. Also 87% of the golf courses in the Triangle, plus the great golf courses of Pinehurst, are staying in business and do a great job under ordinances that restrict noisy operations to 7 a.m. The clubs you mentioned failed due to the historic housing recession and the particular business practices of the developers, not as a result of increased golf course lawn maintenance costs or noise complaints of homeowners. This issue is not golf course noise in general, it is about a proposed change to increase the noise and allow it to be louder and earlier without any input from people impacted. I’m sure you’ll agree there is some level of noise and some time of start that is unreasonable to start making that noise, and the purpose of public hearing is to find a level we can all live with. We are not trying to eliminate golf course noise and we do accept the deal we made when we made our home purchase. It’s that they are now changing the deal that is the issue. Thank you for your interest and comments. If mowing doesn’t bother you at 3am it must be because you don’t have your hearing aid in, but knowing it is going on at 3am means it has some impact on you. Telling people to move because the noise level changes is not right. Most golf courses in the US follow the 7am start time. Golf courses like everyone else should be a good neighbor, loud noises at 6am is not being a good neighbor. If they can’t get done what needs to be done staring at 7am it is time to get a new ground keeper superintendent or hire more people. Enter your email address to follow LetUsSleep and receive notifications of new posts by email.